Our customer operates a sugar mill that is one of the longest continuously functioning works in New Zealand and is an important industrial landmark. Built in 1884, the refinery site on the north side of the Waitemata Harbor is ideal because of its deep water close to the shore, and it has a processing capacity of 10,000 tons per year. Above: Photo of the Load Zone Containment Skirting installed. Its dock facility receives shipments of raw sugar every 6 weeks, with the volume of spillage estimated at 1 ton at the transfer point each time. 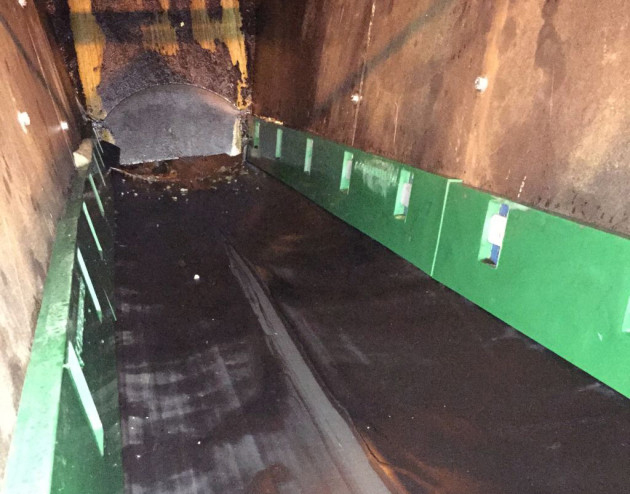 The clean-up time of this spillage takes 8 hours each load, plus additional disposal costs. The business operates with social responsibility and environmental goals supported by internationally recognized environmental accreditation under ISO 14001. Our customer maintains this status through continuous improvement. 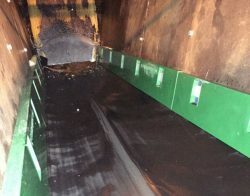 It was the plant manager that identified the need to reduce this spillage problem and sought an alternative remedy to managing this regular spillage task. 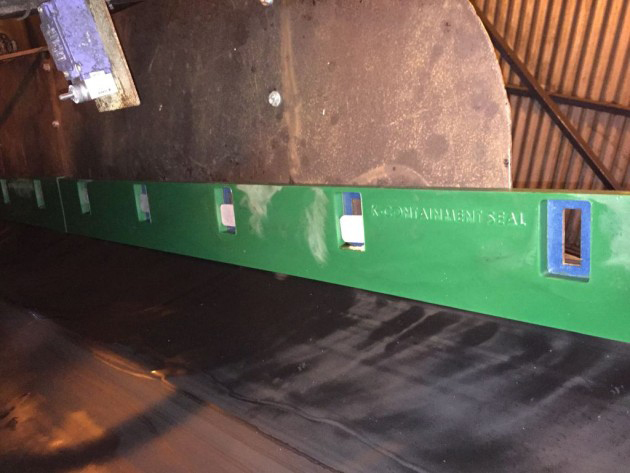 Critical to any effective conveyor transfer point is an effective seal. Containment Seal is a high performance, low friction steel backed engineered polyurethane system that offers exceptional resistance to wear. Installed inside the chute, it is designed to withstand the high impact pressure and also protect the chute itself. The slotted arrangement allows for simple maintenance ongoing adjustment, requiring minimal labor resources to maneuver. Spillage after the installation of the Containment Seal was reduced from 1 ton to 17.64 lb. (8 kilograms).